The University of North Georgia switched its public safety app from Rave to LiveSafe, which has more features including the "SafeWalk" option. "SafeWalk" allows the user to invite friends or family members to watch them as they walk or drive from one point on campus to another. University of North Georgia (UNG) students, faculty, staff, or visitors can ask a friend or even the campus police to watch them walk to their cars or buildings with the new public safety app, LiveSafe. "You can also have direct interaction with a 911 operator with this app," said Greg Williams, assistant director of emergency preparedness in public safety at UNG. The SafeWalk button on the LiveSafe app is just one of many options offered. Williams said the wealth of choices on LiveSafe is one reason UNG changed to a different app. A second reason was several University System of Georgia schools employ the same app, which adds another benefit. "If you go to a seminar at another college, how would you learn about an emergency on campus?" Williams asked. "With LiveSafe, you can switch the platform from UNG to University of Georgia for example. 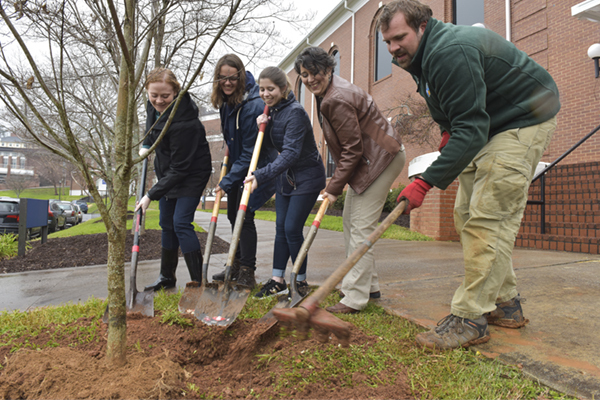 Then you would get emergency alerts on your phone there just like you would if you were on UNG’s campus." Carleigh Smith, senior implementation manager of higher education at LiveSafe, said 140 universities are using the app along with corporate clients, sports stadiums, malls and entertainment venues. LiveSafe was founded by Shy Pahlevani, a victim of a violent robbery, and Kristina Anderson, a survivor of the 2007 massacre at Virginia Tech. "They wanted to create a platform to send information to 911 and report any suspicious activity or behavior," Smith said. LiveSafe will replace UNG’s current public safety app called Rave Guardian, which will remain active until Sept. 1. 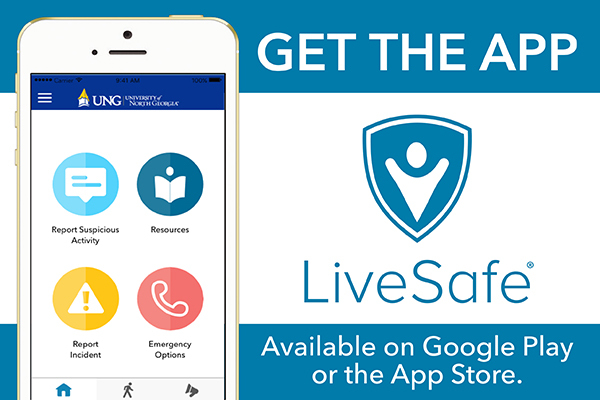 All UNG campuses have access to the LiveSafe app, which launched July 1. The dates overlap to allow students, faculty and staff to remove RAVE and upload LiveSafe to their mobile devices. Search for and download LiveSafe for free from iTunes or Google Play app stores. Open LiveSafe and enter your email address, cell phone number, or tap "Connect Using Facebook." Verify your email address and phone number with the verification email or code. Create a password and fill in your name. Select University of North Georgia as your organization. The UNG logo will appear at the top of the screen once it is connected. Once students, faculty and staff upload the app, they can use its different options. Along with the SafeWalk button, others appear on the screen. "Report suspicious activity" and "Report incident" buttons allows users to share information with UNG’s public safety department. For example, if a faculty or staff member sees a light out in the parking lot or is concerned about a person walking across campus at night alone, he or she can alert public safety. "And they can attach a video, audio or photo clips without calling," Williams said. "Emergency options" allows the user to interact with campus police or local emergency services. Williams said the app comes in handy especially in an emergency. It not only sends out alerts, it can specify a particular area under threat. "Let’s say we have a bomb threat at the library," Williams said. "An officer can create a virtual radius around the library. So if your phone crosses that barrier, that person will receive the alert." 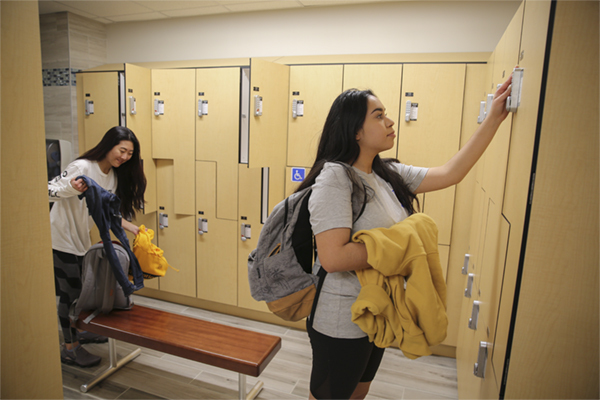 The "Resources" button supplies the user with a plethora of information such as Student Counseling, Student Health Services, community resources, and assistance with finding campus locations. Williams said if a student from the Gainesville Campus goes to the Dahlonega Campus, the map will give the student directions to the building he or she needs. “It shows where I am on campus and the resources around me such as a call box and public safety and other buildings,” he said. To help students, faculty and staff acclimate to the new system, the Department of Public Safety will host a scavenger hunt using the app. Williams said it will include sending a picture of a police car or taking a selfie with a campus police officer, then sending it to public safety using the app. "Participants will be entered into a raffle and win a prize like an Amazon gift card," Williams said. 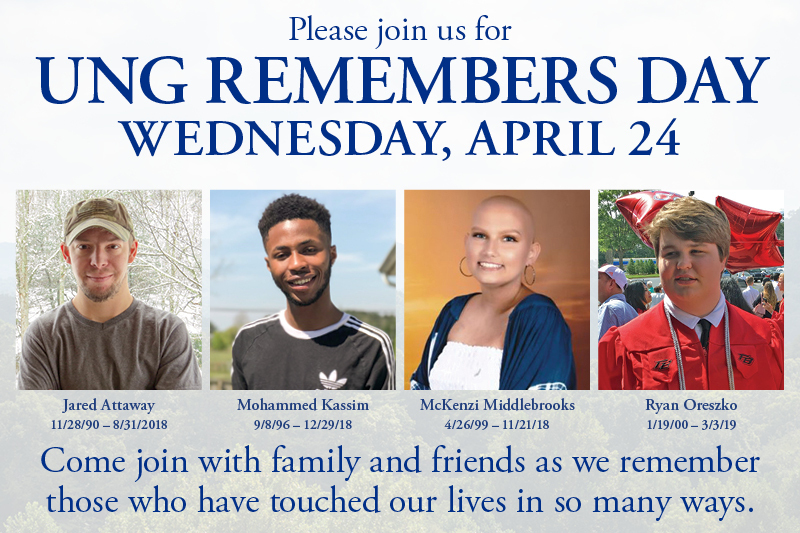 For more information, visit the LiveSafe link.